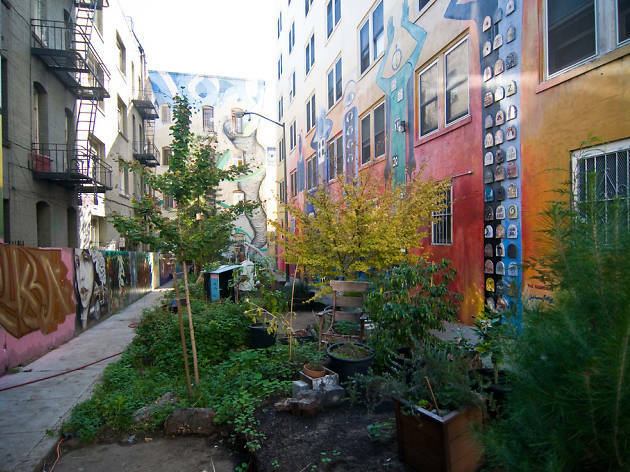 A grand metal gate by local artist Kevin Leeper guards the entrance to this oasis in the Tenderloin. Formerly addled by crime, the narrow gathering place used to be known as Cohen Alley. 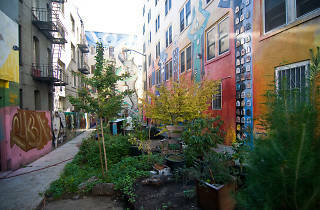 In 2009, gallerists Darryl Smith and Laurie Lazer (co-artistic directors of the Luggage Store gallery nearby) transformed the 23-by-136-foot alleyway into the Tenderloin National Forest, an unusual garden where art and nature collide. The makeshift forest is filled with trees, flowers, herbs and vegetables, all bordered by colorful murals, artful birdhouses, koi ponds—even a handmade clay oven. The garden hosts occasional performances and art events.